So here we have the Cantina Crowds first book review! And since it’s written by me, it seems fitting that it should be a Star Wars novel that gets mauled by my inexpert reviewing! This was a weird one for me, as I suspect it was for other Star Wars fans. The mixture of the zombie horror (which I don’t think I’ve ever read before) and familiar Star Wars names and faces really confused me sometimes. It didn’t detract from the book, but it did take a little getting used to. It was a bit like eating a Subway in a Pizza Hut – not a bad experience, but hard to reconcile the two in your head! There was plenty of gore, some pretty creepy scenes, and a minimal of sci-fi jargon, so it does it’s job in the zombie/horror category pretty well. It’s a bit light on the sci-fi/Star Wars side, but I think thats intentional, the author keeping the focus of the narrative very much on the small group of survivors, and not strying out into the wider universe of rebellions, Sith, and Jedi. There’s enough references to keep Star Wars fans happy (most of the action take place on a Star Destroyer after all), but not too much background fluff to worry about. It assumes you either already know the wider backdrop, or that you don’t care, either of which works perfectly well. 1) Far too many coincidences – It just so happens to be Kale’s undead dad that bites him, and it just so happens to be a zombified Kale that’s chasing Trig through the air vent, Sartoris manages to catch Trig in mid air with a malfunctioning speeder, etc – that really did test the boundaries of my suspension of belief. I mean I’m all in favour of a bit of deus ex machina, and I understand that at times these crazy coincidences do happen. But seriously, there’s a limit, even for someone as ready to believe as me. 2) The characters never really felt like they developed. Han and Chewie were the same as in coutless other books (not a bad thing! ), but the others never really grow beyond their roots in the first chapters. I think it’s largely down to a lack of character interaction in the story, with most of it taking place with solitary characters, or protracted sequences following their thoughts, but without really exploring them beyoind the most rudimetary levels. This made it hard to connect to the characters, and resulted in a real lack of concern for their well-being. 3) Han Solo and Chewbacca. The more dedicated Star Wars fans amongst you may have heard the gripe that everyone and everywhere in the galaxy far, far away is in some way connected to Han Solo – and this book does nothing to dispel this notion. Han and Chewie felt almost like an ad placement in this book, almost as if the editors were woried people might not get that this was a Star Wars book and had the author re-write the roles as Han and Chewie. They don’t really add much (certainly nothing any other smuggler couldn’t have brought to the party), and it actually lessens the sense of threat in the book, as we all know that they’re protected by their Character Shields, and so won’t die/get maimed/become zombies. It’s almost embarrassing to see them popping up un-needed in a book like this. 3) It’s short. I know I have a penchant for long books (I blame Robert Jordan and his Wheel of Time epics), but this bok isn’t just short on pages, it feels short when you’re reading it. There seem to be scenes missing, and sections where details and the potential for character development are trimmed down to the bare minimum needed to keep the story flowing. Even at the end I was left wanting more, but in a bad way. I wanted to know at least some of the plot details that are left hanging loose (was it all a dastardly plan by the empire? What happened to the Purge and the Star Destroyer? What is the Star Destroyer called? Why did no-one – including Han/Chewie – ever mention this again?). Perhaps they’ve deliberately done this to leave a void perfect for a sequel to fill, but to me it just feels a bit rushed. In spite of these annoyances, it’s well worth reading, if only to see another, darker side to Star Wars novels! 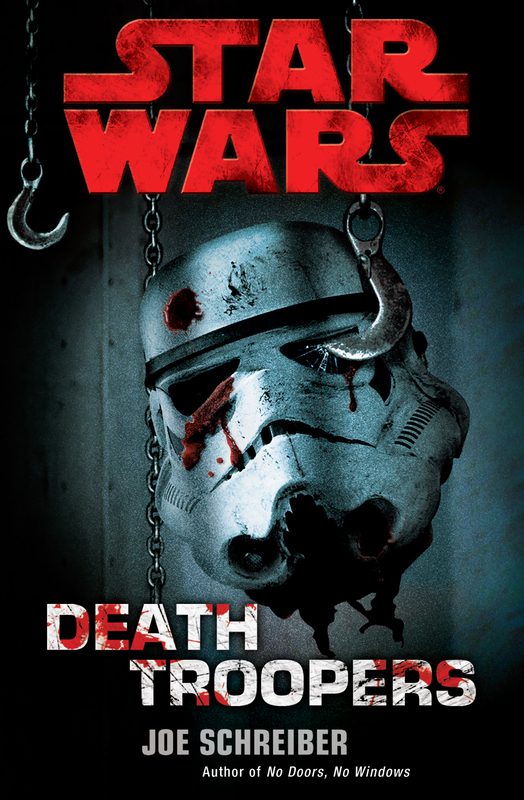 This entry was posted on Thursday, October 13th, 2011 at 3:19 PM	and tagged with book review, Death Troopers, deathtroopers, Joe Schreiber, Rooney, Star Wars and posted in Books, Books Reviews, Star Wars. You can follow any responses to this entry through the RSS 2.0 feed. « In with the new?